He was a day laborer, and had three children in Guatemala. He was standing on the corner of 6th Street and Union in the community of Pico Union or Westlake. The police claim he had a knife and was intending to use it on a pregnant woman. Many eye witnesses say that this was not true, and that Manuel was murdered in cold blood. This is nothing new for LAPD in general and the Rampart Division in particular. We've lost too many innocent people at the hands of law enforcement in Los Angeles. 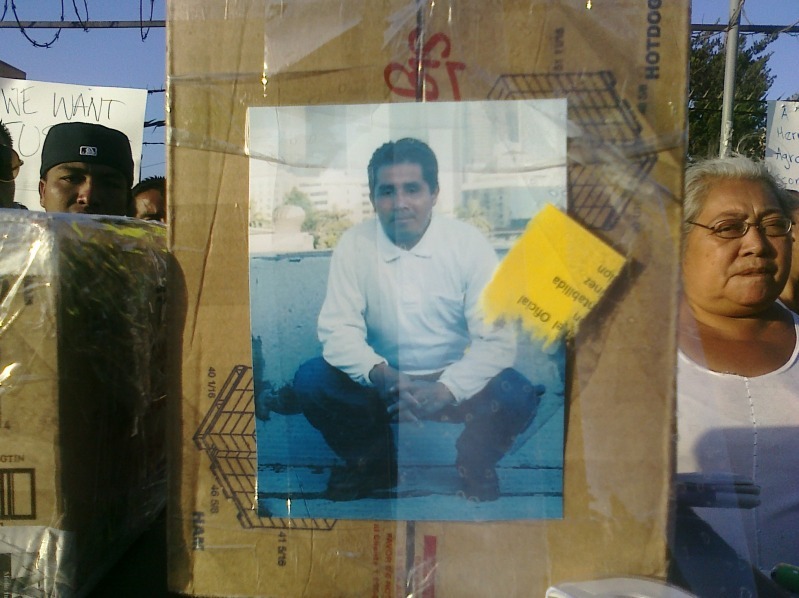 In Pico Union or Westlake community, the people who live there, who are friends of Manuel, who are from Guatemala, Central America, Mexico, and elsewhere, people have had enough. They said, "Ya Basta!" They rose up in a rebellion that has lasted two days in the area. The police provoked them by shooting rubber bullets and tear gas at people, resulting in the uprising. People hurled eggs, rocks, burning dumpsters, televisions and other debris at the police from the streets and buildings. 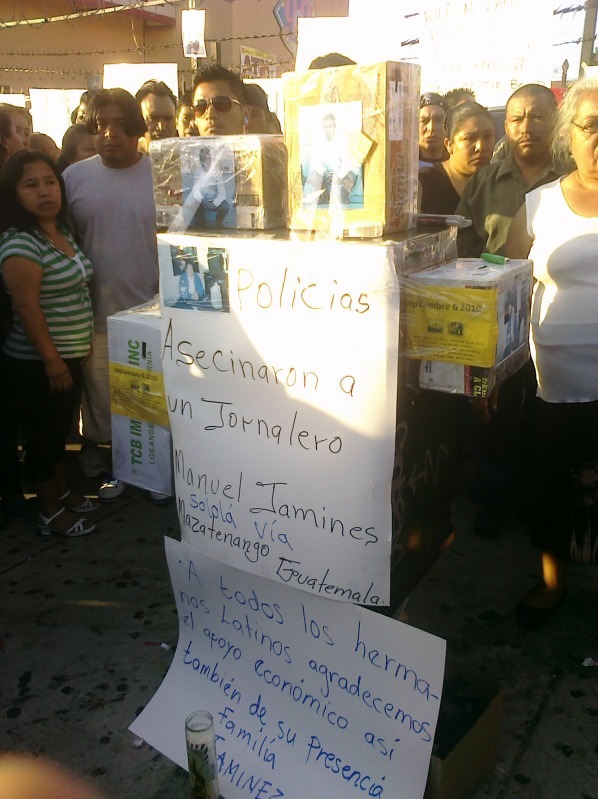 Yesterday, Tuesday, September 7th, 2010, the community stormed the Rampart police division, to demand justice for Manuel. 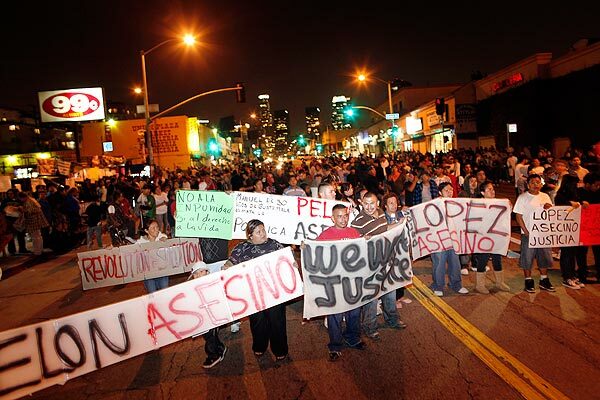 Putting this uprising into some historical context, in the Rodney King Rebellion of 1992, the police were quoted saying, "If this was an insurrection, Pico Union would e enemy territory." It's a community that has had experience in struggle, in many ways. In 1992 the police arrested more people in that neighborhood than anywhere else. Pico Union has the largest concentration of people from Central American, than anywhere else, outside of "Central America." People come from a first hand experience of Revolution and Civil War. They were forced to migrate here because of u.s. imperialism, and what it has done to their homelands. So people are still angry at that, then they are made to deal with the Rampart division. The powers that be understand that the Pico-Union neo-colony is a threat to them, and a ticking time-bomb. They unleash the most brutal police division on the community, some of this was brought to light during the "Rampart Scandal," in 1999. Rampart police try to lie to the people and say that this is the new and improved division, even though not long ago they also murdered Dontaze Story not far from where Manuel Jamines was murdered. The Guatemalan community was angry and wanted the one responsible handed over to them. They wanted to exert their form of justice, and they got it in the streets. In the indigenous community where Manuel Jamines is from, the people go as far as an eye for an eye, they call this Mayan Justice. Reflecting on the rebellion, as a supporter of the community, I have to say that this was inevitable. This was just the spark that people needed, to say enough! Some opportunist organizations and activists might take credit for this, but even they cannot stop it. The community is really tight knit, and self-organized. In my opinion, those activists, supporters, and people on the sidelines, should try to find ways to be in solidarity with people. They shouldn't try to be "vanguard leadership," or try to stop them. Those people, just need to get out the way of the community. You can stop a tsunami, rebellion is justified!